We’ve all been taken aback by the stories of tragedy and heroism that played out as bullets rained down on 22,000 concertgoers in Las Vegas last month. With hundreds of off-duty law enforcement officers and personnel from dozens of agencies in attendance at the Route 91 Harvest music festival, it is likely that you know someone affected or perhaps may have even experienced that unimaginable night yourself. The horrific incident cut short the lives of 58 victims — police officers, teachers, college students, retirees and many more. In a 10-minute hail of deadly gunfire, approximately 600 people were struck by rounds, fatally or otherwise. Among the many off-duty officers shot and injured were two from the LASD family. 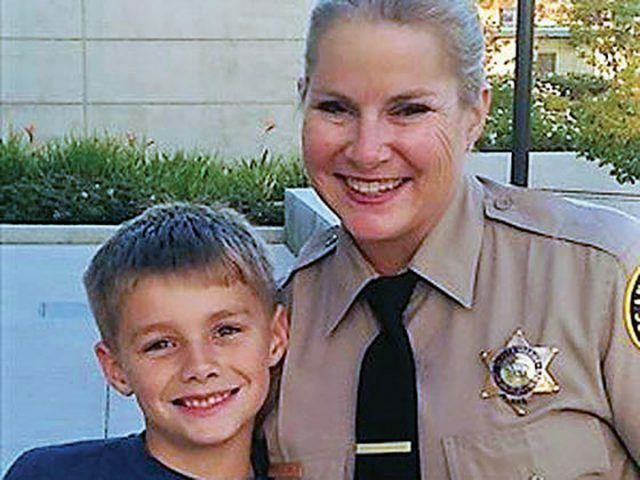 Deputy Lori Kammer is a 16-year LASD veteran who currently works as a school resource officer out of Norwalk Station. At the festival, she and her husband, Sergeant Todd Kammer, were enjoying the closing performance by country music singer Jason Aldean when the first shots were fired. After the shooting began, Lori and Todd tried to save lives by ordering people to keep their heads down. During the third volley of gunfire, Lori was shot in the hip and critically wounded. The bullet hit her pelvis and fragmented into her stomach, damaging her intestines. Even then, she mustered the energy to run from the immediate area. When the pain become so severe that she could run no farther, Todd carried her to a wall hundreds of yards away. Lori was eventually transported to a hospital in the bed of a good Samaritan’s truck along with other gunshot victims, one of whom was dead. Following surgeries and time spent in the ICU, she was flown back to California for recovery. The bullet is still lodged near her appendix and doctors have no plans to extract it. Sergeant Andrew Dahring is a PPOA member and 21-year Department veteran assigned to Administrative Services Division as a Board of Supervisors liaison. 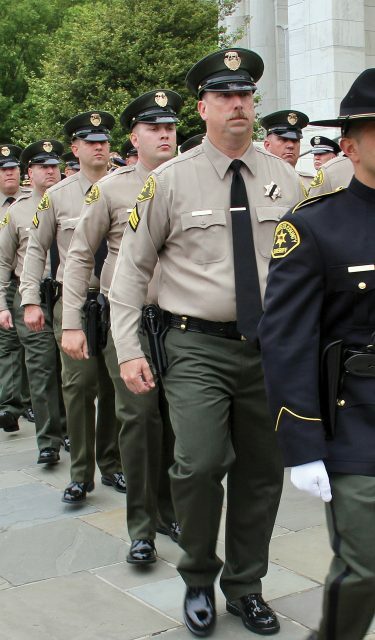 He was attending the event with his wife, Nancy (LASD lieutenant), when he was shot. 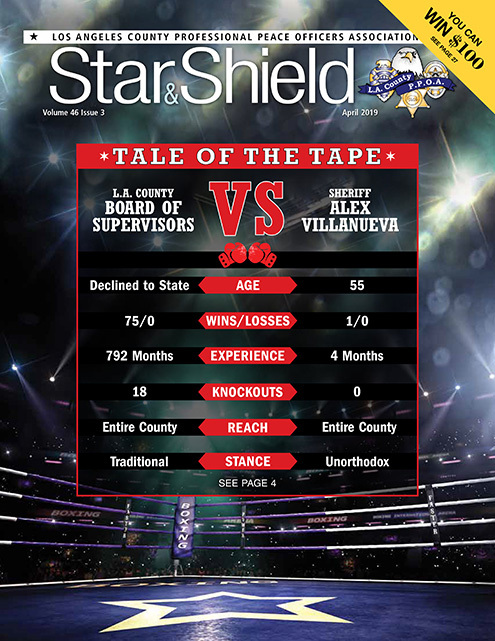 Andy was admitted to a Las Vegas hospital for treatment before being transported to Huntington Memorial Hospital in Pasadena. He is now recovering at home. 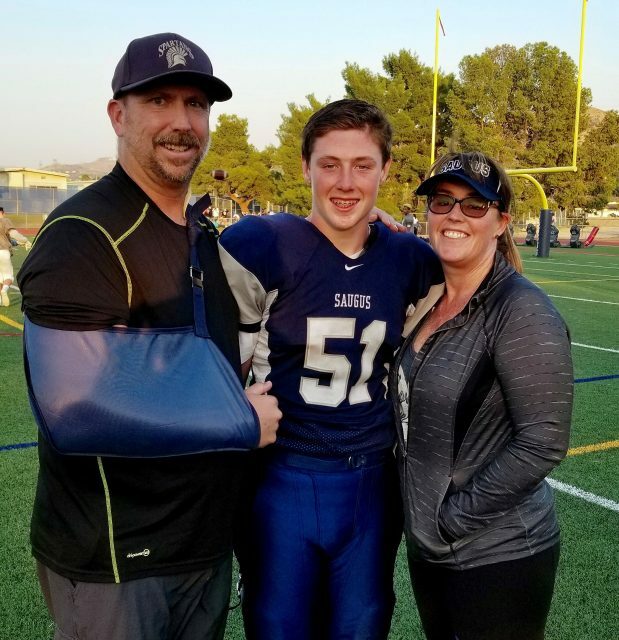 I spoke with Andy late last month to get an update on his recovery and to learn more about his fateful experience in Las Vegas. He was kind enough to take the time to pen the message on the following page. Without going into too much detail, I will give you a brief overview of that night. I was shot twice. The first must have been a ricochet, or at least passed through something before hitting me on the right side of my back. That round bruised the lung. As my wife and I ran, we took cover behind a bar. I laid on my wife, attempting to shield her. It was at this time that I took the round to my neck/shoulder area. I told her I had been shot and people I didn’t know pulled me closer to the bar for more cover. I instructed the man I was leaning on to push on my shoulder as hard as he could because I wasn’t sure of the damage and needed to stop the bleeding. He did, and kept saying, “I got you, bro, I got you.” He pushed on it until we decided we needed to run again. When there was a pause in the gunfire, we got up and ran to the nearest exit and took cover behind a patrol car. My wife tied her sweatshirt around my shoulder to apply pressure and we ran again to get out of the line of fire. An ambulance came rolling by and others flagged it down; my wife jumped in front of it to stop it. They said they had to go help others and drove off, leaving us. We continued to run toward the MGM. Overall, we ran about half a mile. It was there, at the MGM, that we were able to get some help. We waited for about an hour and half for an ambulance to transport me to the hospital. I arrived at the hospital almost two hours after being shot. Following the shooting, I was told I was going in for surgery. Later, the hospital in Las Vegas stated they wanted to wait 24 hours to do a second CT scan to see if the bullet and bullet fragments moved. On Tuesday, we were told I was going in for surgery in the afternoon, and three hours later a second doctor said I was being released. The communication was terrible between the doctors. We had so many conflicting statements from them; they even stated that during all the confusion, they had physically lost track of me and believed I had walked out of the hospital. Needless to say, my wife lost confidence in the doctors and feared more damage would be done if they performed the surgery. She requested they release me in order for me to be transported to Huntington Memorial Hospital in Pasadena. They agreed and released me. The Sheriff had sent personnel to Las Vegas and they stopped in my hospital room at about 6 a.m. on Monday, roughly eight hours after the incident. They said if we needed anything, they would help to make it happen. My wife called them and explained her concerns with the hospital and that she was asking for me to be transported to Pasadena. They assisted and transported us back to L.A. via King Air and Air 5. Awesome support from the Sheriff. At Huntington Memorial, the trauma surgeons diagnosed me with a blood clot in my lung, a broken scapula and a bruised lung. The Las Vegas hospital had not discovered the blood clot or the broken scapula, even after two separate CT scans. We assume the hospital was just overwhelmed and was just not equipped for the number of victims. My personal internal medical doctor said I was a very lucky man to be alive as the bullet just missed an artery. Additionally, he said I needed to thank my wife for saving my life. Her decision to have me transferred to Huntington Memorial literally saved my life. He smiled and told me that my wife and I were even, as he believed that I saved her life by shielding her. I have a follow-up with the orthopedic surgeon on November 10. He is hoping to start me on physical therapy. Once I start therapy, they will monitor me, and if the bullet located underneath my scapula causes pain or discomfort, or inhibits my motion, they may have to do surgery to remove it. As of now, the shoulder is doing well. I still have pain and limited motion. The muscle and tissue damage is healing, but every day is getting better. I am resting, trying to take it easy, following the doctors’ orders and letting my body heal. As for the blood clot, I go back for a vascular CT scan in December. I will continue with the blood thinners and pray that my body is breaking down the blood clot. My thoughts on that night: When the ambulance transported me, they could only take the wounded. My wife was left at the MGM and all I heard on the ambulance radios was that there were two shooters on the roof of the Mandalay Bay, an active shooter in New York-New York and other calls. My concern was for her safety as I wasn’t able to be there for her. My phone was in my hand in the ambulance as I keep my ID in the back of it. My phone rang and I received multiple texts. I was able to answer and tell friends that I was OK, I was shot but OK, and my wife was at the MGM by herself. I needed someone to get her to safety. The deputies who called started a phone chain and reached a friend (Santa Clarita Detective Ryan Elsee) who was able to find Nancy and bring her to the hospital. By 2:30 a.m., two LASD sergeant friends were standing at my bedside. They had heard about the shooting and rolled from home to support us. By 3 a.m., two more deputies arrived to support. Truly amazing — I knew that my wife was being cared for. I can’t thank the guys enough for the kindness and care they showed us that night. We are truly grateful for all of the support of our peers, the Sheriff’s Department, PPOA, Sheriffs’ Relief and the community. My wife and I have always tried to support others in need, we have been there to support our peers and Department members in these times. It’s a humbling experience to be on the receiving side of all the prayers, thoughts, words of encouragement and support. It’s been the support that has made the difference in our lives. We could not be more grateful for the Sheriff’s Department family we are a part of. The outpouring of support has been overwhelming and just so humbling, and we can’t thank everyone enough. Words can’t describe what this support has meant to us. We thank everyone.